Sunday lunch called for something quick and simple, as the planned menu didn't really work out. So I took the few prawns we had left in the freezer, boiled some quinoa, heated a frying pan and threw sweet corn, sweet peas, asparagus and cashews in with some garlic and curry spices. Then added the quinoa and prawns and served with some fresh vegetables (greens, cabbage and cherry tomatoes). Voila! Really tasty (oh.my.god. cashews in food is amazing! ), healthy and simple! This meal is gluten-free, and can be made nut free by just excluding the nuts, or vegan by removing the prawns and adding soya beans for example. 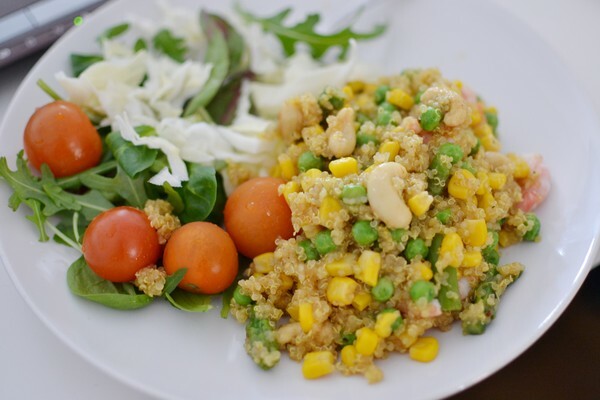 The quinoa provides good quality carbs and is also very high in protein. Cashews provide healthy fats and protein, and the prawns are just awesome, lean protein too. The vegetables speak for themselves. Never eat a meal without fruit or vegetables. Just don't.